by JapaneseFromZero.com - Learn Japanese! This tutorial will show you how to install Japanese typing and display ability for ALL programs running on all versions of Windows XP. 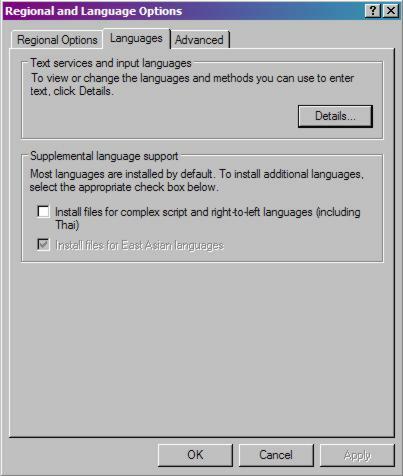 These steps also make it possible to install programs written in Japanese originally intended to be installed on the Japanese version of Windows. There are 3 tabs on the top of the page that will open up in the "Regional and Language Options" area. Click on the one labeled "Languages". Click the checkbox on for "Install files for East Asian languages". This will NOT require your Windows XP disk, but it will take a few minutes depending on your computer's specs. After these files have installed click the "Details" button and move to Step 3 explained on this page. After clicking the "Details" button on the windows above the following screen will display. 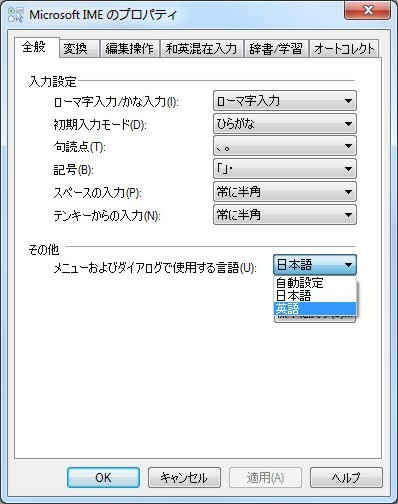 Click the "Add" button to add Japanese input capability to your Windows XP system. Scroll down and select "Japanese". If you do not see Japanese as an option make sure you completed Step 2 on this page. You DO NOT have to set your default input language to Japanese. 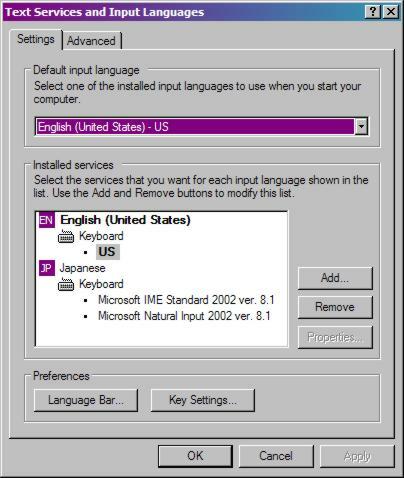 It is recommended that you keep default input language as English. After you add a Japanese keyboard the window should look like the graphic below. 1. Click "Add". 2. 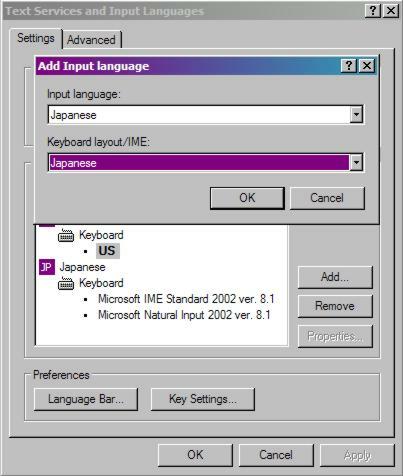 Choose Japanese input language and keyboard layout/IME. Now that you have completed Steps 1-3 you can go back to the "Regional and Language Options". From here click the 3rd tab on the top labeled "Advanced". and or wish to install Japanese programs on your computer. All you need to do is select "Japanese" in the first and only drop down list on this page. You DO NOT have to do anything in the "Code page conversion tables". 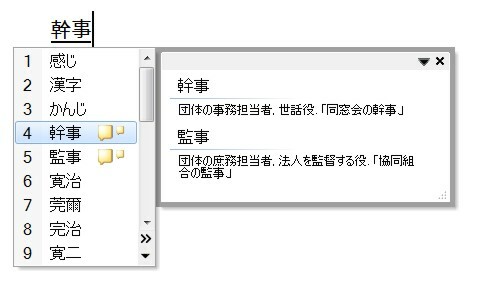 After selecting "Japanese" click OK and then close out all other windows. Now proceed to the final step. 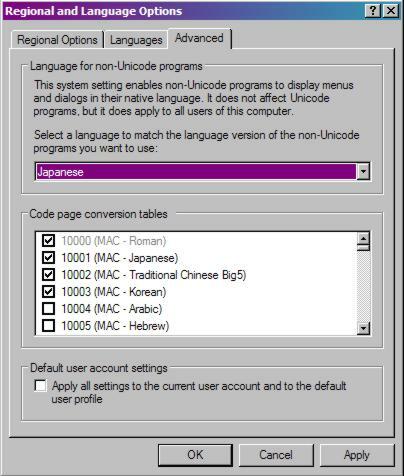 Now your computer can display and type Japanese in all programs installed. Open up Office Word, Word Pad, Note Pad to test typing in Japanese. 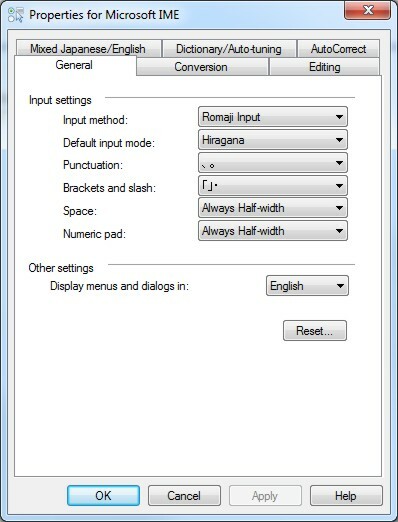 With your cursor placed on a new document somewhere on your screen you will notice a Language Bar. Click the "EN English" and then select "JP Japanese (Japan)". This will change the Language Bar's appearance. If you can't read Japanese you will want to change the language bar display to English. Click on then the option. This window will be ALL Japanese, but don't worry because the next time you see this window it will be in English. There is a language selection menu in the section. Choose and then click "OK". After you click okay you will see that the Language Bar is now displaying in English, if you click "Tools"
then "Properties" you can now see the IME properties in English. You do not need the language bar on the screen at all times to type Japanese. In step 10 you will learn some very handy shortcuts that allows you to keep the Language Bar hidden. This will put the Language Bar near the clock in the Windows 7 task bar. From there you can easily change your input language. In any text editor or Office application you can now type Japanese. Make sure that you have selected Japanese in the Language Bar. which is the long way to say "English typing mode". Change this to "Hiragana". Even though you are choosing Hiragana, you will type Japanese using English letters. Once you are in the correct input mode in your document, let's type a practice word. Type "kanji". You will notice right away that once you type "ka" Hiragana replaces it. 1. Begin typing the word "kanji". 2. Hiragana will display. 3. Full Hiragana word displayed. 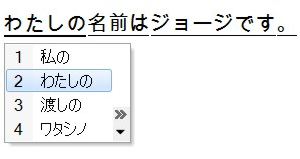 If you are okay with this "Hiragana" only word you can simply hit "enter" to accept. 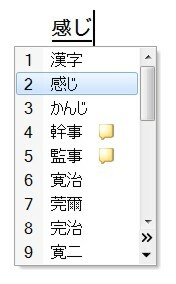 Hit the space bar 1 time to display the most common Kanji for the underlined hiragana. Every time you hit the space bar a different selection will display. Once you find the one you like hit "enter". NOTE: You can also type the number next to the selection to choose it. You do not have to choose kanji word by word when typing Japanese. IME is very smart when it comes to choosing the correct Kanji for your sentence. Contrary to popular belief almost all Japanese people use this method to type Japanese. 1. Type a full sentence without hitting space. 2. Hit the space bar once for most common selections. 3. Hit the space bar to cycle through each word in the sentence. 1. Change language on the fly. 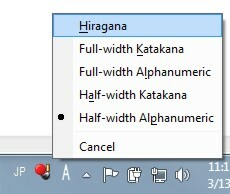 NOTE: Japanese mode default setting is normally "half width alpha numeric". You can change this in the language bar properties. OR you can quickly switch to hiragana mode with the shortcut below. NOTE: The '~' key is on the left side of the 1 key. This is handy if you are already in Japanese input mode and want to switch back and forth between typing English and Japanese. After typing a word, before you hit enter you can force it into different versions using the function keys.